This brick structure in Minnedosa was built in 1920 for the Manitoba Power Commission, predecessor to today’s Manitoba Hydro. Nearby is a hydroelectric power dam completed by the Minnedosa Power Company in 1913. 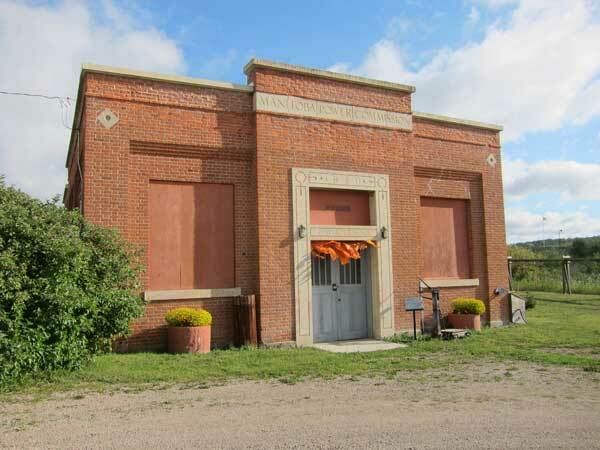 With the addition of diesel-powered generators inside this building in 1920, this became MPC Substation No. 2. Minnedosa was connected to the provincial power network in 1930 and this station was phased out in 1933. The diesel generators were kept for standby service until 1944. The property was turned over by Manitoba Hydro to municipal control in 1980 and is now part of a collection of historical buildings at the Minnedosa and District Museum. Minnedosa Power Company Building, NE 1-15-18 W.P.M., Minnedosa, Manitoba Historic Resources Branch.